Tanabata, who hosts the monthly themed posting challenge Hello Japan, decided that this month would see everyone (appropriately) post around the topic of Cherry Blossom, or Sakura. For those of you unaware of its importance in Japanese life, the Cherry Blossoms bloom across Japan every (Northern) spring, travelling from Okinawa in the south right across the country before falling into the sea off the northern expanses of Hokkaido. The beautiful, but temporary, blossoms embody the concept of mono no aware, the fleetingness of things, symbolising the ephemeral nature of existence. A time to stop and reflect on the brevity of life (or sing loudly and drink bucketloads of sake in local parks – your call). Will Ferguson, a Canadian working in Japan as an English teacher (which does not necessarily mean that he has any qualification – or aptitude – for teaching), got drunk one night and declared that he would follow the Sakura Zensen (Cherry Blossom front) across the country from south to north, adding that he would make it even harder by hitchhiking. Remarkably, he actually did it too. 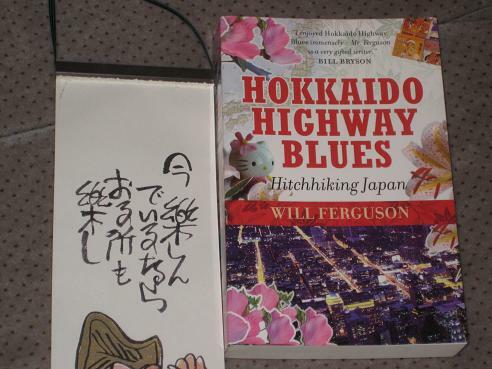 His story is related in Hokkaido Highway Blues (later renamed – shudder – Hitchhiking with Buddha), a wonderful travel book which anyone who has lived in Japan, or just likes sushi, would enjoy. Like any good travel book, this one has the right mixture of well-constructed humorous tales, a wide cast of supporting characters, some helpful, some not so, and the odd serious and (at times) poignant moment. Ferguson’s reason for hitchhiking the journey was not only to save money (although one suspects that this was more true than he’s prepared to let on), but also to experience the country and the people in a different way. He theorises that cars are part of people’s personal spaces and that by letting him into their car, the people who pick him up are actually accepting him into their lives, if only for a short time. At the start, Ferguson is full of bravado and good humour, and his quest seems heroic, if somewhat quixotic. However, the further he follows the elusive blossoms up the country, the more he, and the reader, starts to question his motives. Just why is he hell-bent on making it to the northern tip of Hokkaido? What will happen after that? More importantly, is his quest to prolong what is meant to be a brief moment of perfection actually perverse and doomed to failure? i like the premise and am curious to see how the cherry blossom project ends. and i do like bryson's works so i'll think i'll give this one a read. thanks for the review. It's well worth a read, especially for anyone who likes travel books (and occasionally has itchy feet!). I certainly love the subject matter- traveling across Japan, and sounds like a great travelogue. Thanks for sharing. I don't think I would have picked this up on my own, but your review whetted my appetite.